Important needing help! Anyone know the size of the shims that sit behind the 4 satallite gears within each diff? are the 3 by 6 by .02 or by.03. Nice driving and nice home made carpet track my friend. Your buggy looks dialed in. The most important thing is how satisfied your are with the way the buggy feels, thus if you are happy and turning times you like I would change a thing. I believe when you have your vehicle set up to your liking its best not to get locked up in the over tuning game, thus spending time burning packs is more beneficial than over thinking your tuning. If she runs good and you like, don't change a thing just keep burning packs. i really really like it and today i spent like 6 packs all day practicing. The only thing i would like to change is to harden the suspenssions a little from 500 to 600 for example in front and from 450 to 500 on back. Hi, been searching this thread extensively concerning the issue of hexes. Looks like XRAY's +0.75mm 12mm front hexes with either xray wheels or 22-4 front wheels and +1.5mm 12mm rear hexes with xray wheels will give 245mm width in the front and 247mm in the rear. I'm coming from team associated b5m and b44.3 cars and have a lot of b44.3 front wheels and b5/b44.3 rear wheels. Would love to be able to use them, but keep the same width's of 245mm in the front and 247mm in the rear. Has anyone figured out which xray hexes to get to run b44.3 fronts and rear wheels? Looks like getting exotek 1408 hexes will give a 247mm rear width if using ae wheels. But, haven't figured which hex to run on the front (xray or exotek) in order to use AE front wheels and get a 245mm width. There is some info on here about the hexes. 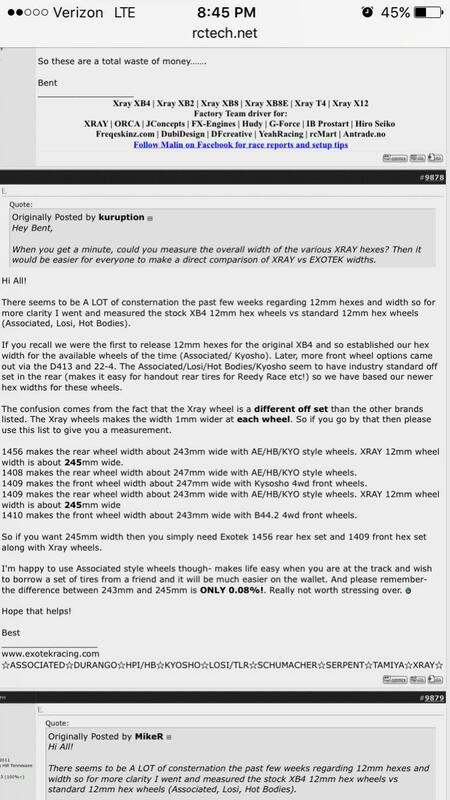 Search posts by "Bentka" seems like he answers that question a lot about wheels. Where has he been anyways. I haven't seen him post in a little bit. Usually he's answering all types of questions on here. Take note of the last sentence. Unless you absolutely have to be super precise with the car width for some reason the difference between 243 and 245mm is .08%. I wouldn't be too concerned with it. As long as you get somewhat close. thanks for that info. I saw that post too when I was doing some research. Bentka actually refuted that statement, as from an xray standpoint, ideally, that 2mm can make a slight difference regarding traction. I'm probably not good enough to notice a difference. But, at the same time, researching the ideal product is fun for me. I'll figure out something. I know this car is really good even with the exotek hexes and AE wheels. Two of my friends who club race with the xb4 are crazy fast with it. But, trying to see if there's something else I can do to get an extra edge. It's true that 2mm can make a significant difference in the way the car handles. I'm often amazed at how 1mm or 2mm in track width, ballstud height, shock angle, or droop can sometimes dramatically change lap times. That being said, no matter how many times I measure the track width with PL 22-4 rims, TLR 22-4 rims, and X-ray rims, I always get the same measurement with the 12mm hex on the same car, back to back doing things as close to the same way as possible. How do I adjust the roll center to get more traction? I would want to lower the roll center correct? To do that do I just simply move the ball stud on the rear camber link up a hole on the shock tower? Would I also want to do that on the front tower too? What is the car doing that you don't want it to do, and what is the car not doing that you want it to do? FYI: I know some of you guys have figured this out, but in case you were wondering like myself, I figured out how to get the 245mm front width and 247mm rear width as recommended on first page. One option is to go with what's recommended on first page of using xray +0.75mm hexes (or can use the exotek front 5mm hexes) with 22-4 front wheels (or xray wheels) and use exotek's rear 9mm hexes with AE wheels to get the 247mm rear width. This way, if you're coming from a b44.3/b5m like me and have a ton of AE rear wheels, you can at least keep your rear AE wheels. Please correct me if I'm wrong on the above. But, this is the info. that I've gathered here. can't wait to get this buggy on the track. Just looking to get more traction is all. Do I just move the ballstud up a hole on the shock tower? And would I just do that in the rear or would I also do that in the front too? Thinking ACE Hardware may have the above. Hey all. New to the thread and vehicle. I checked out the first post, but it seems to mainly just talk about hex widths and link to the advertising pages on XRay's site. Is there a specific post or other resource I should go look at while the buggy is on its way to me? Any required upgrades or specific tips for things like the center diff, which I plan to eventually get? I'll only get to run it now and again, but when I do it'll primarily be on medium to high bite clay (one dusty and running something like super soft electrons, one damp and super smooth with slicks), both rather jumpy but also tend to include a sweeper type section. I might make it to a "medium pile astro" that I'm told has enough give that you still slide around, unlike carpet. I tend to be more of a point and shoot or "late brake" driver, where I go in hard and then turn while on brake, then like to lock down and punch it coming out of a corner. I want to slowly work my way towards being a smoother driver in this regard so I can do a set up that can carry more mid corner speed for sweepers and non-180s, but that's where I am right now. Any suggestions on starting setups would be welcome. Welcome to the Xray ride Dave. How's the east coast treating you? All times are GMT -7. It is currently 05:04 PM.